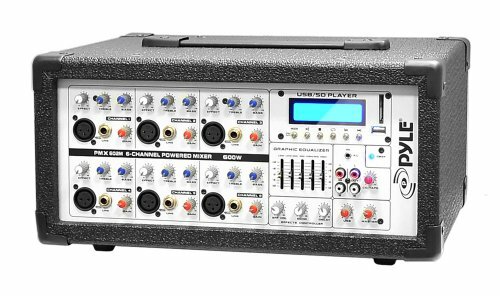 The Pyle PMX602M is your PA mixer and amplifier solution. This 600 watt, 6-channel system provides audio control and is perfect for controlling the audio at social gatherings. Connect it all; features include six balanced microphone inputs, six high-impedance microphone/line inputs, audio line input for connecting Smartphones or MP3 players and a pair of RCA audio jacks for connecting additional devices like CD players or tape recorders. Additional features include independent channel volume and equalizer controls, master effects control with echo, delay, 5-band graphic equalizer, LCD digital display screen and more! Take control of the sound, and the crowd, with the Pyle PMX602M. Convenient Carry Handle - Power:110/220V - Power Cable Included - Dimensions (W x H x D): 12.9" x 8.3" x 10.5"